Greetings from the Weldon School of Biomedical Engineering! George R. Wodicka stands in front of the new Biomedical Engineering Building. Greetings from Purdue's newest and only named engineering School, The Weldon School of Biomedical Engineering. One of the most tangible and truly unifying endeavors has been the construction of our new Biomedical Engineering building. As alumni, students, corporate partners, friends, faculty, and staff, it is a facility in which we can all take enormous pride. Furthermore, it is with great delight to report that the building is ahead of schedule and will be ready for occupancy this summer with a dedication to take place next fall. As always, we appreciate your support, advice, and guidance. Your participation is crucial to our continued success, and with your help we will reach even greater heights. The new home of the Weldon School of Biomedical Engineering has taken shape and has begun to fill with the components that will transform it from a structure into the premier biomedical education and research facility in the world. 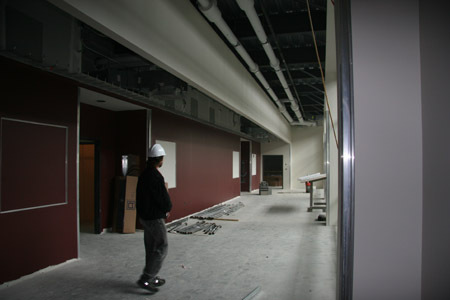 According to staff engineer Kirk Foster, who is serving as point person for BME on completion, The building is progressing rapidly and is on schedule for move-in during the summer of 2006. Classes and research will formally start with the fall 2006 semester, and the building will be dedicated around Homecoming. Gr oundbreaking for the new building occurred on September 26, 2003 and was made possible in part by a generous grant from the Whitaker Foundation. All too often, the design of any new facility is based on the past. An institution tells a designer that they need X-type of building, so many square feet, so many classrooms, so many labs, and a new building is proposed based on the way things have always been done. This time, design has been focused on the future. As biomedical engineering bridges many different disciplines, the design process for the new building brought together architects, faculty members, and staff in new ways. Plans and ideas were examined in light of how they will affect, or be effected by, emerging teaching and research paradigms as well as advances in technology. The result is a design that enhances discovery on multiple levels, from encouraging student and faculty interactions with informal and formal gathering spaces to strategically aligning research facilities, so as to maximize sharing of both traditional and non-traditional resources. In areas where a need for continual adaptation is expected, from interpersonal interactions to technology changes, provisions were made to allow quick modifications to meet future needs. The building site was chosen so that it functions as a gateway between the academic campus and the expanding, translational research-intensive Discovery Park area of the university. Key buildings within walking distance include the Lynn Hall of Veterinary Medicine, the Birk Nanotechnology Center, the Burton D. Morgan Center for Entreprenuership, the Bindley Bioscience Center, and Lilly Hall. Flexible response to the continuous, fast-paced, changing needs of the medical industry and healthcare is critical to successful biomedical engineering, and to the education of tomorrows biomedical engineers. This new facility is designed to enhance this capability for both teaching and research activities. Designers worked with faculty members and staff researchers to ensure that all resources needed, from consumables to appropriate electrical power supply, were readily and safely accessible. Securing research space for taking stable measurements with highly sensitive instrumentation was also configured into the overall building design. The building incorporates a number of these specialized areas. One example is the optics laboratory which is built on its own concrete slab in the basement, and sits independent of the rest of the facility. This design ensures that vibrations which could affect measurements are eliminated. In other labs, special lighting equipment was chosen to eliminate lighting-induced electromagnetic interference with extremely discriminating sensors. A major announcement during Homecoming festivities was a $525,000 gift from the Guidant Foundation to launch an innovative and interdisciplinary program between the Weldon School of Biomedical Engineering, the Krannert School of Management, and the Indiana University School of Medicine. Known as Biomedship, the program will foster entrepreneurial ventures in biomedical technology by bringing together business, researchers, and physicians, and in so doing facilitating the development of new treatments and technologies. The walls are moveable, the utilities drop down from the ceiling, a staff is available to assist research leaders with incorporating new or specialized technology to research efforts, and some 18,000 square feet of space are now available to interdisciplinary researchers seeking to advance collaborative research in nanotechnology, biology, and engineering. The Bindley Bioscience Center was dedicated October 1, and is one of the centers that is part of the connectivity provided by the new home of the Weldon School of Biomedical Engineering. Imagine a repairman capable of entering and working in a human cell, or a specialized tool invisible to the naked eye being built atom by atom. These are just a few of the promises of nanotechnology, and Purdue is advancing its leadership in this critical area with the dedication of the Birck Nanotechnology Center on Oct. 8. The 187,000-square-foot facility hosts a suite of clean rooms and high accuracy labs that will allow structures to be probed on almost an atom-by-atom basis. As with the Bindley Center, the Birck Nanotechnology Center is a critical part of the connectivity provided by the new home of the Weldon School of Biomedical Engineering. We hope you have enjoyed the first electronic newsletter from the Weldon School of Biomedical Engineering. Our intention is to provide you with news of the School, its students, alumni, and industry partners on a regular basis. Doing this requires something from you: Your Input. We need your comments and suggestions on each issue; information on what you want to see covered; and, most of all, your news. 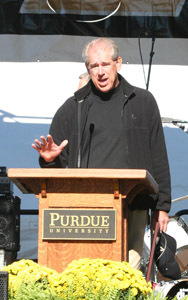 Please submit news items and other feedback to Brian Knoy at bjknoy@purdue.edu. If you have received this message in error, or no longer wish to receive it, please send an e-mail with the subject line UNSUBSCRIBE to bjknoy@purdue.edu.